First off is Ron Fawcett’s story of his life of climbing. One of the first true ‘rock athletes’. Ron was one of the first climbers to embrace modern athleticism in climbing. He was one of the first to understand the enjoyment of sport climbing, and harness it as a tool to make a game changing leap forward in trad climbing standard. Needless to say the legacy of his climbs are still slapping the strong and bold of today - Careless Torque (Highball Font 8a), Toy Boy (E7 7a) and Master’s Edge (E7 6b) to give a few examples. A classic example of the quiet, unassuming brilliant athlete. Trad climbing plus is a comprehensive full colour manual on how to do everything trad climbing demands of you - from tying in to psychological control. An accessible style of writing and nice full colour pics on just about every page of the techniques in action will mean you can use this either as a one stop course from beginner to expert, or an instant reference for a technique you suddenly realised you need for tomorrow’s climb. Up European climbing report - This year’s report of everything important that happened in climbing in 2009. There are always great interviews in Up as well and this year was no different. The highlight was an extensive interview with Johnny Dawes with lots of interesting pics, old and new I hadn’t seen before. Performance Rock Climbing - the original climber’s training bible from the early nineties. It was so good it’s still mega popular today and only in the past couple of years has been matched and complimented by a couple of good modern titles (also in my shop!) I bought it when I was sixteen and went from F6c+ to F7c+ in the following 12 months. I read it so many times my copy looks like it’s been chewed up by a pit bull. Man, it’s always nice to come home. We are just back from a wee trip visiting Claire’s brother in Bermuda. Being a miniscule island waaay out in the atlantic and fairly isolated it’s a quirky place! We’ve visited before, but this time it left more of an impression. I think last time it was too hot for a Scots brain to function and I walked about like a sunburnt zombie most of the time. This time it was cooler and some reasonably brisk physical activity was possible without body meltdown. The above wee video shows a couple of problems I found in these old smugglers caves. The first one seemed pretty tricky but it went easier than expected (V10) when I caught it in ok conditions. Like many small islands I’ve been to it’s culture has many faces. Many good, some not. On the surface there’s the brightly painted houses, pictures of the Queen and everyone saying “Good afternoon” to each other. But then you go for a morning run and barely a single car moves out for you, leaving joggers in a gauntlet between the narrow walled roadsides and the cars whistling past your toes. I gained a new appreciation for both how much I love the open spaces I’m lucky to have access to, and how much of a privilege they are! Bermuda seems to be going through the same struggles many wee communities go through - for the balance of positive and negative forces to keep leaning positive while adapting to the rest of the world changing around it. If you ordered from the shop while we were away - Thanks for being patient! Normal dispatches will be resumed in the morning. 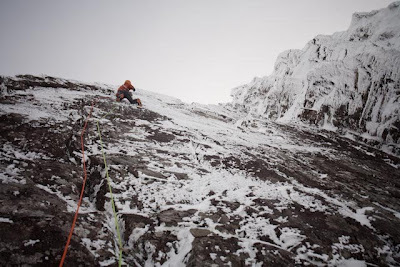 Many of you will have read on this blog recently that we repeated the legendary week of new ice climbs on Ben Nevis by Robin Smith and Jimmy Marshall in 1960. The stories of both men’s climbing inspired so many of us Scots climbers when we were first discovering the Scottish mountains for ourselves. We realised it was crazy that we didn’t have Smith’s biography in the shop. I’m not totally sure if his untimely death in an avalanche at 23 makes the story of his life even more powerful, or if it’s just his sheer talent on the rock and ice, combined with his personality in his writings and other deeds that make this so important. Obviously, Smith is always going to be a hero for Scot’s climbers. No doubt this book will find him some more admirers who might otherwise not have come across his story. Arno’s first book on mental skills development for climbers was the first of it’s kind and has obviously been a well thumbed reference before many a soul searching lead, including my own. Having made contributions to Arno’s second title - Espresso Lessons, we obviously were primed to bring that to you as soon as it came out a few months ago. And it seems you’ve been loving it! Again, we realised that a lot of you won’t have read the more comprehensive original text from the Warriors Way. So we have that available now too. Last up due to popular demand we have Jerry Moffat’s story of his career - Revelations - back in stock again. This time in the new paperback format at £12.99. I’ve been away from home a week and already winter seems a long time in history. Some time out of immediate goals for climbing and working has been great. 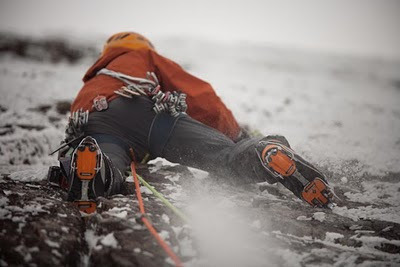 The never-satisfied obsessive in me is trying not to let me just be chilled and happy with recent superb quality bits of climbing done on the icy Scottish cliffs. Anubis - a big idea in my head, in the bag. Although it was much easier, getting the Tempest nailed before I left was quite satisfying too. More just because everything came together neatly, with the help of my friends. However, I do have a habit of looking for the problems and holes to fill in the future. And so I’ve had my first few tentative sessions of rock climbing, the first in a couple of months (when you have a winter like we’ve had, one has to feast). I’m in poor shape for it. It’s not all bad. My base level of fitness is high and fingers still have good basic strength. Plus my head for leading is quite good just now. But I have lost so much of that ‘snap’ - the confidence to grab small holds and pull immediately. A kg of superfluous muscle bulk is only much use for carrying wet ropes and gear through snowdrifts and not for my boulder projects. So that will need to go. Starting afresh is nice though, many mountain trad routes and boulder projects in the mind for this year and strong motivation to go and climb them well. I want to go to them when the time comes, feeling confident, fit and positive. So the foundations for this have to start now. Went for a run yesterday, only intending 40 minutes or so but ended up running for a couple of hours and didn’t really want to stop when I got back. Encouraging. I think it’s going to take some time for the rock confidence to show through again. The thought of the moves I was nearly managing in September on my highball boulder project seem a mile away in my imagination. Even if it’s not really like that, it’s good for me to think I’m a mile off that level. It’s energy for the work ahead. About 9 years ago I was struggling my way up Crest Route in Glen Coe. Stopping to fiddle with gear in iced up cracks and shiver on belays, I was transfixed my the sight across the Coire on Summit Buttress. I was watching Neil Gresham toprope practicing what was to become The Tempest M9. It looked amazing seeing him in the distance swinging from hook to hook, dangling about working moves before lowering down to the comfort of a belay jacket. Predictions on the future of climbing never quite work out. As it happened, the standard of winter routes in Scotland rose by a good bit in the intervening nine years without redpointing, although by climbers gaining their fitness with plenty of redpointing in other disciplines. And it rose firmly holding onto it’s place as the home of many of the hardest mixed climbs on the planet. While the redpointed routes of Haston and Bubu’s era were repeated often, graduates of M12 and M13 redpoint would still find Scottish IX ground up a considerably harder proposition. So things move on. And the obvious challenge was to make at attempt at The Tempest in more traditional style. Along comes Andy Turner, with lats that eclipse the low winter sun and the kind of confidence of a trad leader up to the job. The big problem with the Tempest though, was the rotting fixed gear left behind by the redpoint action years earlier. Andy was forced to abseil down and remove as much of the melted in wires as he could. 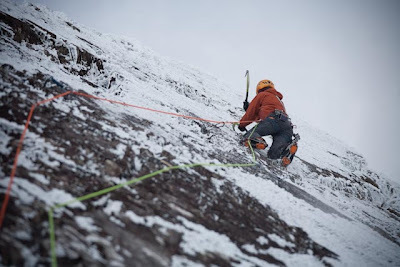 Then, after a couple of sessions wandering about on the open wall, fiddling in wires in verglassy cracks, he committed to the thin overhanging ice finish, heart in mouth no doubt and took the tempest a step closer to the grade X,9 that Neil projected for an onsight ascent. After Andy broke down the aura of going on the wall without working moves, and proved it was possible to place the gear on lead. I was pretty keen, no, desperate to go for an onsight attempt. And so I set off, washing vast quantities of rime off the wall with my hands to excavate the crack underneath. After 2.5 hours, I was 6 metres from the top, but had run out of gear. I’d managed to take plenty of gear I didn’t need and not nearly enough of what I did. I didn’t fancy a major peel from the final moves without gear but was desperate not to lose the onsight either. Solution? Downclimb the whole thing taking the gear back out and come back after a rest. A day later I was stuck for a partner but an emergency Tweet and gracious response from Iain set me up with Matt and Nic to finish the job. After the alpine sun of the last month, it was Scottish business as usual, getting lost in the Coire for an hour just trying to find the route through the mist and snow. Various rubbish wires were found underneath the ice smear, as I waited for the constant dousing in spindrift avalanches to let up for just a bloody minute and allow me to gasp through the final moves.